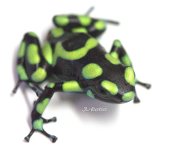 The Tesoroso yellow auratus (Capurganá morph) is a smaller auratus morph from northern colombia. One of the most striking auratus morphs, they appear to do well in groups and are quite bold when kept in a proper set-up. Frogs offered are captive bred, unsexed and approximately 7-11 months or older. Sexed pairs are frequently available.